I can’t explain the cause behind it, perhaps it’s my part obsessive – part controlling nature, but over the last 8 years of parenting I’ve always felt anxiety. In the weeks and days leading up to my daughter being born, I’d wake up in the morning feeling so tense. It was like someone could bounce a quarter off my shoulders and neck. Were we prepared enough? Was the nursery absolutely stocked and perfectly prepared for her arrival? Did we have enough wipes? Enough onesies? Was the car seat installed properly? Would I be successful in being able to get us to the hospital in time or would I get my honorary M.D. delivering our baby in the front seat of my new car by way of a YouTube how-to video? As it turned out, her delivery went off without a hitch – so I probably should’ve calmed down a bit, right? As we were discharged from the hospital, I was tasked with driving my baby girl home during rush hour traffic in West Los Angeles. Aside from taking my driver’s test, it may have been one of the only times I had my hands anywhere remotely close to a 10-2 position on the wheel. No more kicked-back lazy hand dangling over the top, my firsts were clenched with knuckles as white as Ivory soap. Even eight years later – as we’ve added two boys to the mix and wait anxiously for another baby girl to arrive in late April of 2018, nothing much has changed. I still can’t just relax. We all struggle to keep it 100 (am I blatantly unhip?) with the way we parent. Most of us want to put our best face forward, which I understand… to a certain extent. We want everyone to see that amazing Facebook post of our kids dancing in the meadow, slow-motion video of them blowing dandelion seeds into the universe while making a wish. We strive for those picture perfect moments of us reading in a hammock or taking a sunset walk on the beach while holding hands. Everyone needs to see how we have it ‘all together’ wearing our little matching Christmas outfits in the snow in front of an old barn or sitting patiently on the Easter Bunny’s lap. Those kids weren’t dancing in the meadow, they were chasing one another down in a fit of rage because Suzy stole Jimmy’s Pokemon cards. Two minutes before little Connor blew those dandelion seeds across the landscape, he inhaled the first attempt by mistake and it was a level 5 meltdown, combined with choking and dad digging the sprouts out of his mouth with his fingers. The hammock? After the picture, mom got her hair stuck in it and pulled a muscle in her neck as she tried to get up. You would think after 8 years and (almost) 4 kids, I’d learn to embrace the unexpected, breathe deep and take it in stride. But it’s not easy and I’ll bet there are a few parents out there who feel the same way. For those of you who can relate to this, maybe it’s time we started looking at parenting in a different light. Maybe we should stop screaming at the top of our lungs every morning ‘because we’re gonna be late’ or having an aneurysm when we realize they got yogurt all over their dress or polo. 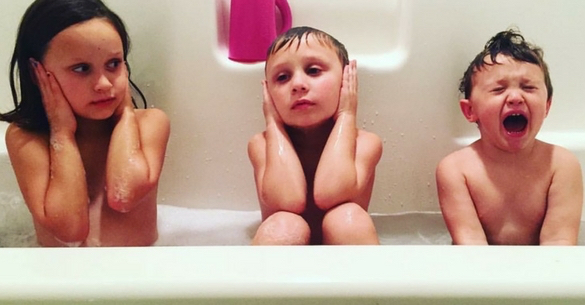 Perhaps we shouldn’t hustle our kids out of the bath every night (do I have the only daily bathers out there?) and instead, let them enjoy taking a nice soak with Ivory products and playing with that handful of Matchbox cars. For bath time, we’ve been using the Ivory Original 3-bar and Ivory Original Body Wash. Both are free of dyes and heavy perfumes. We also like the Ivory Free & Gentle Body Wash with Pear & Sandalwood. It contains the #1 Dermatologist-Recommended moisturizing ingredient! I’ll do my part and fight with every fiber in my body to not go postal when I get to the check-out line at the grocery store and realize my cart is slathered with 38 additional items. Sometimes I’m so deep in the forest, I can’t see the trees. I’m 100% guilty. But if we each try and do one thing every day that pushes positivity onto our kids instead of the ugly opposite, I guarantee they’ll start to notice. I’ve already started – and I can tell you their attitudes are changing. Our interactions are calmer and I notice them finding me more approachable, wanting to engage. This period of time we’re sharing with our kids right now – will be gone before we know it and we’ll never get it back. Let’s do it the right way the first time around. 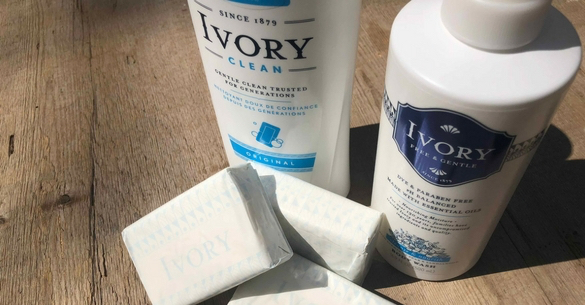 EDITOR’S NOTE: This is a sponsored post on behalf of Ivory Soap – pure, clean and trusted for generations. For 138 years, Ivory has wanted us to sit back, relax and find that soothing calmness we all deserve. For more information on #IvorySoap, check them out HERE, on Facebook, Twitter and Instagram. This is a sponsored conversation written by me on behalf of Ivory. The opinions and text are all mine. « The Revolving Door of Bathtime. I just found this blog, and read this post that pretty much describes exactly where I’m at with my kids right now. I’m a stay at home dad to 3 girls ages 6, 5, and 2. They drive me freakin’ bananas sometimes, but I find that when I try to keep it positive even when they drop the damn yogurt container like I freaking KNEW they would, that they seem happier and more engaged. Keep up the good work, dude…it seems like you’re rocking it.